Go old school with this value priced printed crew neck sweatshirt. Full front print. 50% cotton and 50% polyester. Also available in a hooded option here. Beautiful, long lasting embroidered design. 50% cotton/50% poly. Classic collegiate styling at an economical price. Front print. 50% cotton/ 50% polyester. Also available as a crew neck sweatshirt here. Ladies Vail Logo Vest: Ladies sized 100% poly 200 weight polar fleece vest. Has all the great qualities of polar fleece it's light weight and really warm. Same as our full zip, minus the sleeves. Embroidered Vail on left chest. 100% polyester. This Jacket is made of soft 275g fleece with zipper pockets. It comes in all the latest fashion colors. This excellent polar fleece jacket is made of a soft 275 g fleece and comes with a full zipper and zipper pockets. With many great colors to choose from and a simple Vail Colorado embroidery, whats not to love about this timeless garment. Enjoy!! Soft and warm winter fleece. Embroidered Vail on left chest with pockets. 100% polyester. Light weight and very warm! 100% polyester, 200 weight polar fleece. Also available as a full-zip here. A true classic. A high quality crew sweatshirt made with 70% Cotton and 30% Polyester and great for lounging around the house or when looking to stay warm with style when out and about. It has a double layer Vail applique with an embroidered Colorado. *Blue is currently out of stock. Don't want a hood? No problem. Same great look, minus the hood. This super soft applique crew is made of 70% Cotton and 30% Polyester, making it very warm and comfortable to wear. *Blue is currently out of stock. A True Classic! This lady's hoody has a double layer Vail applique with "Colorado" embroidered beneath. Very comfortable and soft to the touch. Made with 70% Cotton and 30% Polyester. For those of us who like the convenience of a full length zipper. 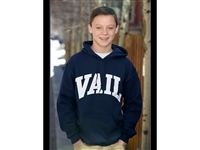 This hoody features a double layer Vail applique with "Colorado" embroidered beneath. Made with 70% Cotton and 30% Polyester.